Oven cleaning is one of the jobs that in the opinion of most of our customers in Enfield is the most annoying chore they come across every now and again. The oven cleaning teams that we can send you at really affordable prices will get this annoying and time consuming job out of your hands and make it so you get the best out of every penny you invest in the job. Our detergents are the best the industry has to offer and along with our steam cleaning machines can tackle every single type of stain or greasy surface your oven has to offer. Our cleaning technicians could come and help you with your oven if you just call us at 020 8050 2865 and book your session with one of our phone centre associates. They'll make sure to give you a price that is the best in Enfield and you won't be able to resist! We always try to get our clients their money's worth when it comes to oven cleaning and so far we've been doing a good job satisfying almost all of them in Enfield. 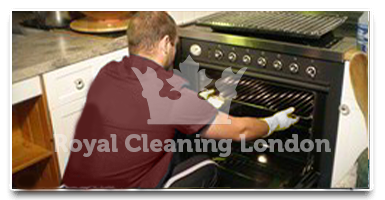 All of our oven cleaning clients in Enfield are entitled to the 200% guarantee policy of Royal Cleaning, which means that if the oven cleaning was not from the highest possible standard and was not enough to satisfy the customer, he can call and request a free re-clean if 48 hours have not passed yet. I've been looking for a reliable cleaning company for the past few months asking around friends and family and looking through forums on the internet and I finally found the right company for me and my home in Enfield. The first thing I booked with Royal Cleaning was an oven cleaning session, which they did brilliantly and after seeing what they can do I call them now on regular basis. If you think that 40 pounds is a lot of money for an oven cleaning, then Royal Cleaning is a great fit for you. Most their oven cleaning prices are below this and are well worth every penny. I've called them 2 times so far and the jobs they did for me in Enfield were more of an investment than anything else, as they brought up the life in my kitchen appliances.